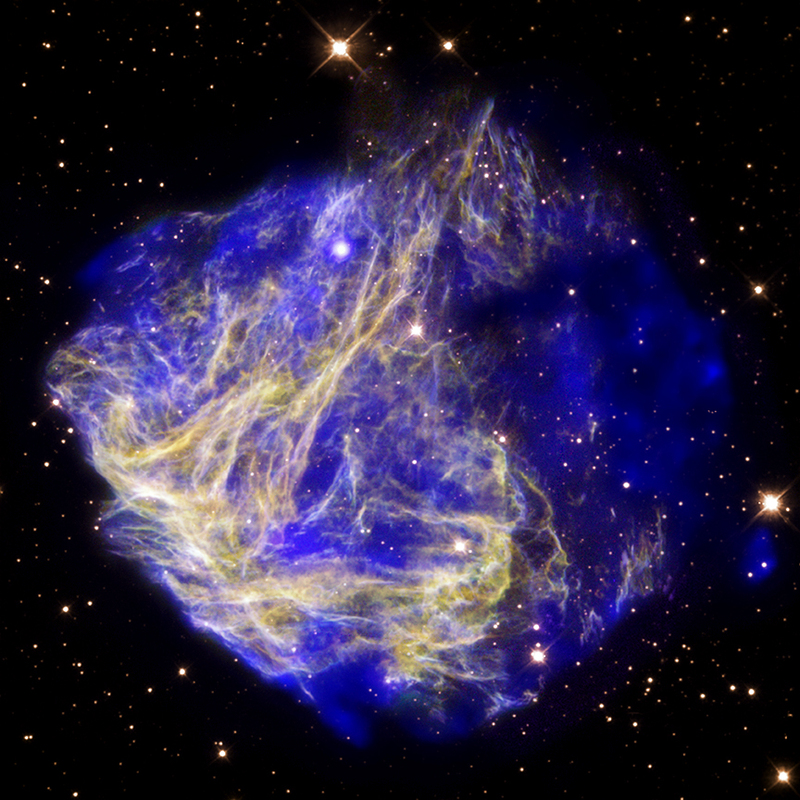 Credit: X-ray: NASA/CXC/Penn State/S. Park et al. ; Optical: NASA/STScI/UIUC/Y. H. Chu & R. Williams et al. Explanation: What is that strange blue blob on the far right? No one is sure, but it might be a speeding remnant of a powerful supernova that was unexpectedly lopsided. 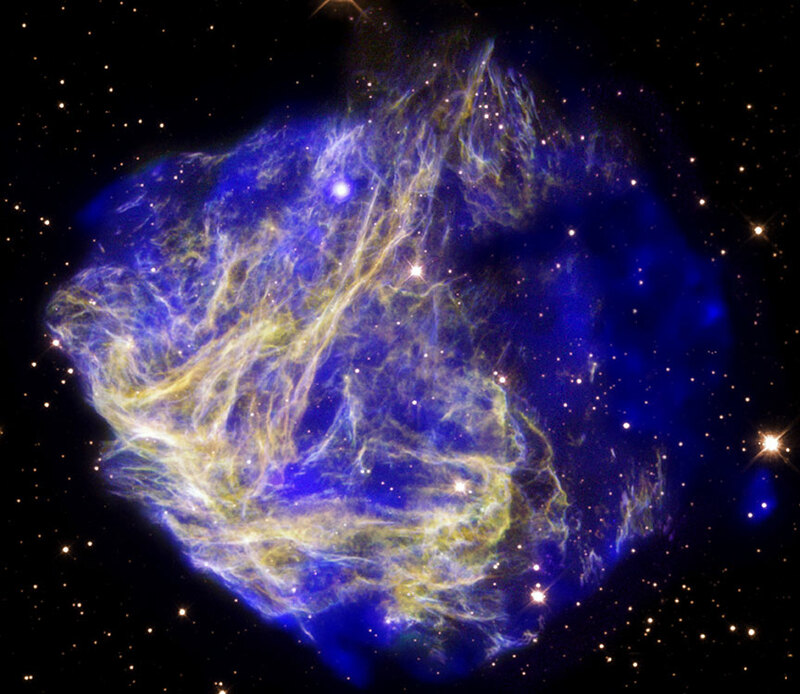 Scattered debris from supernova explosion N49 lights up the sky in this gorgeous composited image based on data from the Chandra and Hubble Space Telescopes. Glowing visible filaments, shown in yellow, and X-ray hot gas, shown in blue, span about 30 light-years in our neighboring galaxy, the Large Magellanic Cloud. Light from the original exploding star reached Earth thousands of years ago, but N49 also marks the location of another energetic outburst -- an extremely intense blast of gamma-rays detected by satellites about 30 years ago on 1979 March 5. The source of the March 5th Event is now attributed to a magnetar - a highly magnetized, spinning neutron star also born in the ancient stellar explosion which created supernova remnant N49. The magnetar, visible near the top of the image, hurtles through the supernova debris cloud at over 70 thousand kilometers per hour. The blue blob on the far right, however, might have been expelled asymmetrically just as a massive star was exploding. If so, it now appears to be moving over 7 million kilometers per hour.